Kyungjae Im, Derek Elsworth, Chris Marone, and John Leeman. The impact of frictional healing on stick-slip recurrence interval and stress drop: Implications for earthquake scaling. Journal of Geophysical Research: Solid Earth, 2017. JR Leeman. A student’s guide to python for physical modeling. American Journal of Physics, 85(5):399–399, 2017. JR Leeman, RD Valdez, RB Alley, S Anandakrishnan, and DM Saffer. Mechanical and hydrologic proper- ties of whillans ice stream till: Implications for basal strength and stick-slip failure. Journal of Geophysical Research: Earth Surface, 121(7):1295–1309, 2016. JR Leeman, DM Saffer, MM Scuderi, and C Marone. Laboratory observations of slow earthquakes and the spectrum of tectonic fault slip modes. Nature Communications, 7, 2016. John Leeman, Marco Maria Scuderi, Chris Marone, and Demian Saffer. Stiffness evolution of granular layers and the origin of repetitive, slow, stick-slip frictional sliding. Granular Matter, pages 1–11, May 2015. J. R. Leeman, M. M. Scuderi, C. Marone, D. M. Saffer, and T. Shinbrot. On the origin and evolution of electrical signals during frictional stick slip in sheared granular material. J. Geophys. Res. Solid Earth, 119(5):4253–4268, May 2014. T. A. Bonin, P. B. Chilson, B. S. Zielke, P. M. Klein, and J. R. Leeman. Development and comparisons of wind retrieval algorithms for small unmanned aerial systems. Geoscientific Instrumentation, Methods and Data Systems Discussions, 2(2):953–979, Dec 2012. J.R. Leeman, C.J. Rawn, S. Ulrich, M. Elwood Madden, and T.J. Phelps. Interpreting temperature - strain data from mesoscale clathrate experiments. Computers & Geosciences, 38(1):62–67, Jan 2012. C. J. Rawn, J. R. Leeman, S. M. Ulrich, J. E. Alford, T. J. Phelps, and M. E. Madden. Fiber optic sensing technology for detecting gas hydrate formation and decomposition. Rev. Sci. Instrum., 82(2):024501, 2011. M.E. Elwood Madden, J.R. Leeman, M.J. Root, and S. Gainey. Reduced sulfur-carbon-water systems on mars may yield shallow methane hydrate reservoirs. Planetary and Space Science, 59(2-3):203–206, Feb 2011. John R. Leeman and Ernst D. Schmitter. Electric signals generated by tornados. Atmospheric Research, 92(2):277–279, Apr 2009. J. R. Leeman and R. May. Building Communities Around Open-Source Geoscience Projects. SciPy, 2018. Poster. Ryan M. May and J. R. Leeman. Growing the foundation for pangeo: Bringing together metpy and xarray. EarthCube All-hands Meeting, 2018. Poster. J. R. Leeman and Ryan M. May. The metpy roadmap: Replacing legacy meteorological tools. American Meteorological Society Annual Meeting, 2018. Poster. Ryan M. May and J. R. Leeman. Metpy advancement and community-driven development. American Meteorological Society Annual Meeting, 2018. Talk. Sean C. Arms, Ryan M. May, and J. R. Leeman. Siphon - simplifying data access and expanding data sources. American Meteorological Society Annual Meeting, 2018. Poster. Matthew B. Wilson, J. R. Leeman, and Ryan M. May. Bulk shear, supercell composite, precipitable water, and more: Exploring metpy’s new cape-abilities with an interactive sounding plotter. American Meteorological Society Annual Meeting, 2018. Poster. Tyler Wixtrom, R.M. May, J. R. Leeman, and K.H. Goebbert. Vertical interpolation in metpy: Sigma to isobaric to isentropic. American Meteorological Society Annual Meeting, 2018. Poster. J. R. Leeman and R. May. Meteorologists and their CAPEs. SciPy, 2017. Poster. J. R. Leeman and C. Ammon. Measuring the seismic and acoustic time of flight - lessons in earthquakes and thunder. American Geophysical Union Fall Meeting, 2016. Poster. J. R. Leeman, R.D. Valdez, R.B. Alley, S. Anandakrishnan, and D.M. Saffer. Poro-elastic properties of whillan’s ice stream till: Implications for basal stick-slip. American Geophysical Union Fall Meeting, 2016. Talk. J. R. Leeman, C. Marone, and D. M. Saffer. Controls on Fault Zone Stability and the Mechanics of Slow Earthquakes. Gordon Research Conference - Rock Deformation, 2016. Poster. J. R. Leeman, C. Marone, and D.M. Saffer. Laboratory observations of the spectrum of fault slip: Implications for slow earthquakes. European Geophysical Union Meeting, 2016. Poster. J.R. Leeman, R. May, C. Marone, and D. Saffer. Modeling Rate-and-State Friction with Python. SciPy Scientific Programming, 2016. Talk. J. R. Leeman, D. Saffer, M. Scuderi, and C. Marone. Laboratory observations of slow earthquakes - insights on the mechanics of slow stick-slip. AGU Chapman Conference on the Slow Slip Phenomena, 2016. Poster. C. Marone, J. R. Leeman, M. Scuderi, D. Saffer, and C. Collettini. The mechanics of slow earthquakes and the spectrum of fault slip behaviors. AGU Chapman Conference on the Slow Slip Phenomena, 2016. Talk. D.M. Saffer, L.M. Wallace, H. Kitajima, M. Ikari, J.R. Leeman, C. Marone, and M. Scuderi. The hydrologic, metamorphic, and frictional habitat of shallow slow earthquakes. AGU Chapman Conference on the Slow Slip Phenomena, 2016. Talk. M.M. Scuderi, C. Marone, E. Tinti, L. Scognamiglio, J.R. Leeman, D.M. Saffer, G. Di Stefano, and C. Collet- tini. Seismic velocity changes across the transition from slow- to fast- frictional sliding in earthquake-like laboratory experiments. AGU Chapman Conference on the Slow Slip Phenomena, 2016. Poster. J. R. Leeman. Measuring gravitational tides cheaply with arduino. American Geophysical Union Fall Meeting, 2015. Talk. J. R. Leeman, D. Saffer, M. Scuderi, and C. Marone. Laboratory observations of the full spectrum of fault slip modes: Implications for the mechanics of slow earthquakes. American Geophysical Union Fall Meeting, 2015. Poster. C. Marone, J. R. Leeman, M. Scuderi, D. Saffer, and C. Collettini. The mechanics of transient fault slip and slow earthquakes. American Geophysical Union Fall Meeting, 2015. Talk. S. Dulin and J. Leeman. Podcasting as an outreach and teaching tool: Lessons learned from year one of don’t panic geocast. Geological Society of America Meeting, 2015. Poster. D. Saffer, H. Kitajima, J.R. Leeman, M. Ikari, C. Marone, and M. Scuderi. In situ conditions and the mechanics of slow earthquakes along subduction megathrusts: Insights from laboratory experiments. GeoPRISMS ‘Subduction Cycles and Deformation Theoretical and Experimental Institute’, 2015.
laboratory data analysis. SciPy Scientific Programming, 2015. Poster. J. R. Leeman, D.M. Saffer, and C. Marone. Laboratory observations of the full spectrum of fault slip modes: implications for the mechanics of slow earthquakes. Seismology Student Workshop, 2015. Talk. J. R. Leeman, C. Ammon, and S. Anandakrishnan. Using low cost environmental sensors in geoscience education. American Geophysical Union Fall Meeting, 2014. Talk. J. R. Leeman, M. M. Scuderi, C. Marone, and D. M. Saffer. The role of stiffness in the dynamics of frictional stick-slip failure: Insights from laboratory experiments. American Geophysical Union Fall Meeting, 2014. Poster. P. Johnson, M.M. Scuderi, J. R. Leeman, J. Riviere, B. Ferdowsi, J. Carmeliet, and C. Marone. Fault gouge velocity characteristics during slow-slip and stick-slip under laboratory conditions. American Geophysical Union Fall Meeting, 2014. Talk. P. Bhattacharya, A. Rubin, M.M. Scuderi, J.R. Leeman, K. Ryan, and C. Marone. The role of stressing rate in state evolution under rate-state friction. American Geophysical Union Fall Meeting, 2014. Poster. J. R. Leeman, M. M. Scuderi, C. Marone, and D. M. Saffer. Stiffness controls on the stability of frictional systems. Gordon Research Conference - Rock Deformation, 2014. Poster. J. R. Leeman. Investigating stiffness controls on earthquake behavior - an ideal environment for python workflows. SciPy Scientific Programming, 2014. Poster. J. R. Leeman, M. M. Scuderi, C. Marone, and D. M. Saffer. Electrical potentials observed during frictional stick-slip - a semiconductor mechanism. American Geophysical Union Fall Meeting, 2013. Talk. J. R. Leeman, M. M. Scuderi, C. Marone, and D. M. Saffer. Electrical anomalies observed during frictional stick-slip in granular materials. 40th Workshop of the International School of Geophysics: Properties and Processes of Crustal Fault Zones, 2013. Poster. J. R. Leeman. Electrical potentials during ice deformation: Theory and laboratory results. Midwest Glaciology Meeting, 2013. Talk. M.E. Elwood Madden, M. Root, S. Gainey, and J.R. Leeman. Gas clathrate hydrate thermodynamics and kinetics: limits on near-surface volatile fluxes for cold terrestrial planet systems through deep time. Goldschmidt Conference, 2012. Talk. J.R. Leeman, M.E. Elwood Madden, T.J. Phelps, and C.J. Rawn. Experimental results of hydrate reservoir destabilization through heating. American Geophysical Union Fall Meeting, 2011. Poster. B.W Umphlett, J.R. Leeman, and M. Morrissey. Detection of wildfires with artificial neural networks. American Geophysical Union Fall Meeting, 2011. Poster. J.R. Leeman and M.E. Elwood Madden. Rapid heat induced clathrate dissociation events - a planetary context. Lunar and Planetary Science Convention, 2011. Poster. S.R. Gainey, M.E. Elwood Madden, J.R. Leeman, and B.M. Guttery. Kinetics of methane hydrate formation & dissociation under mars relevant conditions. Lunar and Planetary Science Convention, 2011. Poster. J.R. Leeman, M.E. Elwood Madden, J.E. Alford, T.J. Phelps, and C.J. Rawn. Evaluation of heat induced methane release from methane hydrates. American Geophysical Union, 2010. Poster. J.R. Leeman and M.E. Elwood Madden. Co2 clathrate formation and dissociation rates below 273k. Goldschmidt Conference, 2010. Poster. C.J. Rawn, J.R. Leeman, S.M. Ulrich, J.E. Alford, M.E Elwood Madden, and T.H. Phelps. Homogeneous and heterogeneous sediment experiments using fiber optic sensing technology for detecting gas hydrate formation. Goldschmidt Conference, 2010. Poster. J.R. Leeman, D.G. Blackburn, M.E. Elwood Madden, R. Ulrich, and V. Chevrier. Clathrate dissociation rates below the freezing point of water. Lunar and Planetary Science Convention, 2010. Poster. J.R. Leeman, M.E. Elwood Madden, J.E. Alford, T.J. Phelps, and C.J. Rawn. Meso-scale clathrate exper- iments: Effect of grain size on formation pathways. American Geophysical Union Fall Meeting, 2009. Talk. C.J. Rawn, B.C. Chakoumakos, O. Garlea, J.R. Leeman, J.E. Alford, M.E. Elwood Madden, and T.J. Phelps. 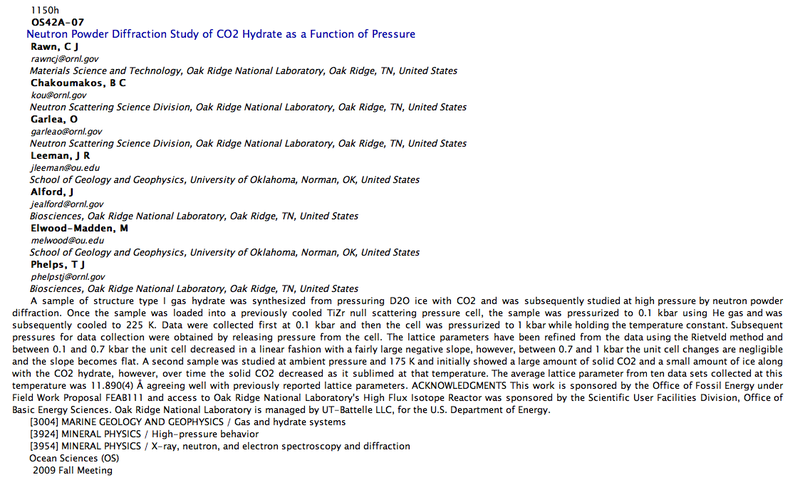 Neutron powder diffraction study of co2 hydrate as a function of pressure. American Geophysical Union Fall Meeting, 2009. Talk. D.G. Blackburn, R. Ulrich, M.E. Elwood Madden, and J.R. Leeman. Experimental study of the kinetics of co2 hydrate dissociation under simulated martian conditions. Lunar and Planetary Science Convention, 2009. Poster. M.R. Elwood Madden, J.R. Leeman, and B. Guttery. Methane hydrates: A source for slow methane release on mars? Hydrates Meeting, 2009. Talk. J. R. Leeman. The Multi-Rotor Hobbyist — Evaluating your Drone Needs. Servo Magazine, February 2018. J. R. Leeman. The Multi-Rotor Hobbyist — Drone Delivery - Part 2. Servo Magazine, January 2018. J. R. Leeman. The Multi-Rotor Hobbyist — Drone Delivery - Part 1. Servo Magazine, December 2017. J. R. Leeman. The Multi-Rotor Hobbyist — Build a Drone Crash Beacon. Servo Magazine, November 2017. J. R. Leeman. The Multi-Rotor Hobbyist — The Lynxmotion Quadrino Nano Flight Controller Review. Servo Magazine, October 2017. J. R. Leeman. The Multi-Rotor Hobbyist — Scanse Sweep 3D Scanner Review . Servo Magazine, September 2017. J. R. Leeman. The Multi-Rotor Hobbyist — Taking the Earth’s Temperature with Aerial Infrared Mapping. Servo Magazine, August 2017. J. R. Leeman. The Multi-Rotor Hobbyist — ESC Basics. Servo Magazine, July 2017. J. R. Leeman. The Multi-Rotor Hobbyist — Brushless Motor Basics. Servo Magazine, June 2017. J. R. Leeman. The Multi-Rotor Hobbyist — Photogrammetry with OpenDroneMap — Part 2. Servo Magazine, May 2017. J. R. Leeman. The Multi-Rotor Hobbyist — Photogrammetry with OpenDroneMap — Part 1. Servo Magazine, April 2017. J. R. Leeman. The Multi-Rotor Hobbyist — Hacking the Cheerson CX-10. Servo Magazine, March 2017. J. R. Leeman. The Multi-Rotor Hobbyist — Fat Shark Teleporter V5 Review. Servo Magazine, February 2017. J. R. Leeman. The Multi-Rotor Hobbyist — Adding Telemetry to the ELEV-8 . Servo Magazine, January 2017. J. R. Leeman. Understanding and Balancing Propellers. Servo Magazine, December 2016. J. R. Leeman. FlyFi: Weather Data Telemetry. Servo Magazine, November 2016. J. R. Leeman. Build your own drone - Parallax ELEV8 Review. Servo Magazine, October 2016. J. R. Leeman. Build your own drone - GPS Guided Flight. Servo Magazine, September 2016. J. R. Leeman. Build your own drone - Part 4 : Training for Flight. Servo Magazine, August 2016. J. R. Leeman. Build your own drone - Part 3 : Drone Electronics and Flight Controller. Servo Magazine, July 2016. J. R. Leeman. Build your own drone - Part 2 : Building an Airframe. Servo Magazine, June 2016. J. R. Leeman. Build your own drone - Part 1 : Getting Started. Servo Magazine, May 2016. J. R. Leeman. Pi booth - a raspberry pi based photobooth. Nuts and Volts, 2016. J. R. Leeman. Morpheus data parsing and plotting: A new approach to large data set analysis with open source tools. NASA Technical Paper, 2011. J. R. Leeman, B.W. Umphlett, and M. Morrissey. Detection of wildfires from advanced very high resolution radiometer (AVHRR) data with artificial neural networks. University of Oklahoma School of Meteorology Capstone Papers, 2011. J.R. Leeman and M.E. Elwood Madden. Collaborative gas hydrates research at OU. Earth Scientist, 2010. J.R. Leeman and K. Keranen. Locating a historic norman gravesite with geophysical methods. Earth Scientist, 2010. J.R. Leeman, M.E. Elwood Madden, T.J. Phelps, and C.J. Rawn. Heat induced production from gas hydrate reservoirs: A meso-scale experimental and modeling analysis. Marine and Petroleum Geology, In Prep. J.R. Leeman, M. Morrissey, and B.W. Umphlett. Detection of wildfires from advanced very high resolution radiometer (avhrr) data with artificial neural networks. In Prep.